Finally, I had an opportunity to climb Germany's highest mountain (2962m), the Zugspitze. About 5 months ago I stood in Garmisch-Partenkirchen at the base of the mountain and was tempted to take the cog-wheel train to the top, but I had decided against it. Firest of all it is very expensive (about 60 Euros for the roundtrip) and secondly I wanted to climb the mountain by foot and on my own and not with a bunch of tourists (which certainly I am not, hehehehe). Well, here I was again, with three days all to myself to play in the mountains. I had left Namur at 5:30pm on Saturday evening and drove pretty much straight through for 7 hours until about 1am, when I was about 1 hour from the trailhead. Near the town of Augsburg I pulled over and managed to sleep for about 4 hours. At 5am I drove the last hour to the trailhead and even though it was still dark, I found the trailhead (or at least a sign pointing towards the Höllental, which was the route I planned to take). I had somewhat reconnaissed the whole are on my previous visit to the area. I was still a bit tired and slept for another 30 minutes or so, until it was getting light enough so I could walk without a headlamp. Acutally, I still had to use the headlamp while getting dressed and packing my back, but when I was ready to go, it was light enough to walk without it. The first thirty minutes were pretty uneventful. I passed a couple of other hikers and stopped briefly to chat with them about the weather. It was still cloudy, but the day turned out ver nice later on. One of the groups I passed actually wanted to do a via ferrata, the Stangensteig. I know there to be some via ferrata travel later in the day, but was surprised to hear that there was one this close to the trailhead. Upon studying the map in a bit more detail I realized that there was indeed a via ferrata, which began before the Höllentalklamm and ended after it. That answered the question for me, because I had some partly in order to hike through the Klamm, which is supposed to be spectacular. After 45 minutes I arrived at the entrance of the Klamm, paid a 3Euro entrance fee and was on my way. And spectacular it was indeed. Use this link for pictures of it, because the ones I took did not turn out nicely as there was not enough light this early in the morning. The Klamm is a very narrow canyon with a wild river roaring through it. There are lots of waterfalls of various sizes raining down from both sides and rapids in the river and it reminded me a bit of Yosemite's Misty Trail early in the season. One more similarity is that one gets pretty wet hiking through it. In some places the trail actually leads through tunnels that were blasted into the rock, because in those places it was not possible to build a hiking path into the narrow canyon. In some instances, I could choose to either hike outside on come very steep and slippery trail (and get completely wet) or hike through the lit (there were lamps) tunnels. Often I chose the later. It took me about 30 minutes to hike through the Klamm. At its end, the canyon opens up and about 15 minutes later or 90 minutes after setting out I reached the Höllentaler Hütte, a big cabin maintained by the German Alpin Club, where most people on this trail spend the night before setting out for the summit in the morning. I entered and found the place packed with people, some just getting breakfast, other already ready to go. I only stayed for 15 minutes to drink a tea, change my shirt and make use of the bathroom facilities. At about 8am I set out again and saw a group of children with a couple accompanying adults in front of the hut just starting out to move uphill. Thinking of the via ferrata that I knew to be waiting at the end of the valley and the inevitable traffic jam that all these people would cause there, I grabbed my bag and ran through an empty river bed to cut in line before the group of kids. One of the adults looked at me as if she found my behavior entirely unacceptable, but I did not really bother anyone and did therefore feel no shame. Furthermore, I was moving much faster than them and soon advanced enough so that they were out of sight. About 15 minutes later I stood at the "Brett" (the board) and could see the beginning of the via ferrata. Here I was at about 1700m, about 1200 vertical, but probably only a kilometer or so horizontally away from the summit. I got into gear and moved up the cables and iron ladders fairly quickly, because there were few people above me. After 10 minutes or so, the cables gave way to high meadows before leading through the scree of the moraine up to the Höllentalglacier. I was getting quite tired on this last section moving through the horrible scree, so that when I got to the base of the glacier I took of my pack and took a break. I ate a banana while getting ready to put on my crampons. I could see a few guys moving up the glacier and there was also a couple groups near me getting ready to move onto the glacier. There was a clearly marked (through footsteps) trail that led in switchbacks up the glacier and I followed it as well. It was good that I had brought the crampons, because even though the glacier travel was fairly short (15 minutes), it was pretty icy and would have been much more difficult without them. At the end of the glacier, I stood in front of a seemingly sheer face of rock, which was the beginning of the second via ferrata of the day. I changed from crampons into via ferrata gear and moved up it, passing a few guys and then following a couple of other people that had began before me. About half way up the via ferrata, there was a group of three coming down from the summit. Interestingly, they were all dressed in vintage clothing and had also old equipment (ice axes and rope). We chatted a bit, and they informed me that they wanted to take some pictures on the glacier. I took a picture of them, but then had to take another one, because one of the guys remembered that his sunglasses were not so vintage, whereupon he took them off for the second picture. About 1.5 hours after getting onto the second via ferrata and after passing a couple of icy and fairly exposed sections higher up, I topped out at the Jubiläumsgrat, which is the traverse from the Zugspitze summit to the Alpspitze summit, something I will definetely come back for one day. 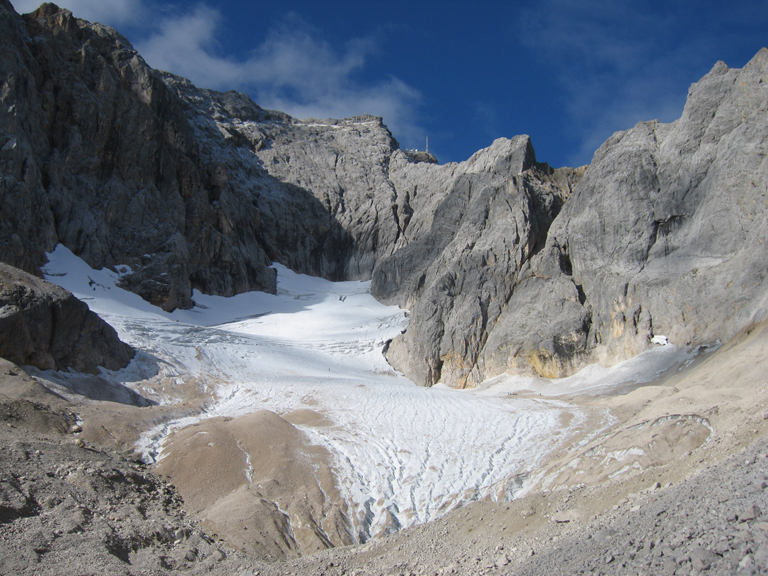 From where I intersected with the Grat, it was only a short stroll to the summit, marked by golden cross and set a bit apart from the Münchenerhaus and the actuall summit plattform. My mouth dropped open when I saw the masses of people on the summit plattform. There must have been hundreds of tourist, the majority of whom had doubtlessly come up with the train. I climbed over to the summit cross, had someone take my picture, before I mingled with the masses. What an anti-climax after this 5 hour spectacular hike with fairly few people on the trail. Here on the summit, it was a tourist trap. Cheesy souvenir shop, lots of places to have a beer and even a mailbox for sending postcards. Of the latter I made use by sending a postcard to Catherine, Anselm and Alma, as well as to my godchild Henning. The advantage about being on the summit was that there are no less than 3 different ways to get down without having to walk. There are gondolas and a cog wheel train. In order to reach the latter one can either take a small gondola or hike down to the "train station" located 300m below the summit. After taking a bunch of pictures I did hike down and eventually took the train down. Originally, I had wanted to hike the normal way down, but because I still a bit of driving to do, and because I had never been on a cog wheel train, I opted for the train option. It took about 1h15 to get down to the trailhead (even though I had parked at a side trail and spent about 30 minutes searching for my car), and the train was moving fairly slow on the steeper sections (what is one to expect of a cog wheel train). The first 20 minutes of the ride are entirely through a long tunnel that has been blasted into the rock and that connects the backside of the Zugspitze with the front (as seen from Garmisch). All in all a great day. It feels good to have done another country highpoint.